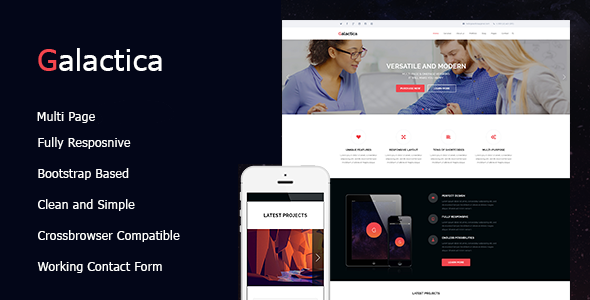 Galactica is a responsive WordPress Theme with fully responsive, flexible layout. This Theme suitable for corporate/agency, Business and portfolio sites. Update History: 20 August 17 ======================================== Compatible With Visual Composer Main Features: Creative Design Flexibility u0026amp; Fully Responsive Theme Well Organized layers makes it very easy to customize Multiple Device Layout Multiple Color Advanced Typography Options – Google Fonts with update button Well Documented Redux Framwork Contact Form 7 Better Support (response within 24 hours) and much more If you like it remember to give 5 stars , and if you need a customization feel free to contact me through my Marketplace Profile. Galactica | Creative Multi has been tested with browsers IE9, IE10, IE11, Firefox, Safari, Opera, Chrome.